The town is dotted with a number of colourful Hindu Temples, Churches and Mosques. En-route to Mannar, the Lady of Madhu Church and the iconic Giant''s Tank are the other main sites of interest that are well worth visiting. 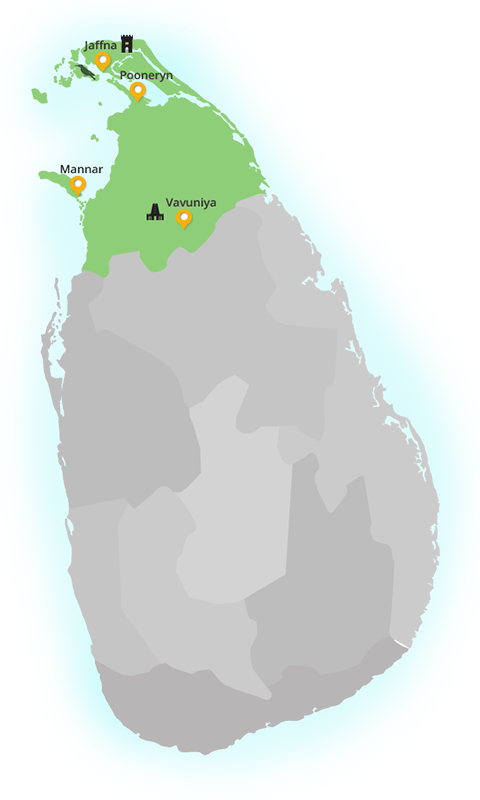 At the western end of the island is Talaimannar, which is regarded as the closest land point from Sri Lanka to India where at its western edge, a series of natural sandbanks known as Adam''s Bridge extend all the way across the Indian coast. According to the ancient Indian epic, the Ramayana, Adam''s Bridge was constructed by Hanuman the monkey god so that he could cross from Sri Lanka to India. Mannar is a birdwatchers'' paradise with a number of brackish lagoons with mangrove habitats, salterns and marshes providing refuge to hundreds of thousands of migratory ducks, waders and other water birds. The highlight are the flocks of migratory Greater Flamingo, which have been seen in the area regularly during the winter months. The Vankalai Sanctuary and Giant''s Tank are the main areas for birding, while a large number of seabirds including different species of terns and gulls can be seen in Talaimannar in the fishing harbor. One of the main landmarks in Mannar Island is this square shaped Fort with four bastions that was built by the Portuguese in 1560. It was taken over by the Dutch in 1658 and was subsequently reinforced before falling to the British in 1795. The Fort is located in close proximity to the newly built causeway that connects the mainland with the Mannar Island. The Doric Bungalow was the residence of Sir Frederick North, the first British Governor of Ceylon. Built in the beginning of the 19th century, this two story house was planned by the Governor himself and designed in the Ancient Greek Doric Order style with sweeping views of the coastline and the Indian ocean on two sides. He established his residence with the intention to revive the pearl fisheries industry in the seas around Mannar. Today, only the red-coloured brick remains of this picturesque bungalow which has collapsed around the headland on which it was built. Believed to be Sri Lanka’s most revered Christian monument, this Church shelters the sacred ‘Our Lady of Madhu’ shrine. This is a miniature but revered Madonna and child statue which was brought to the present site in 1670 by the Catholics fleeing the Protestant Dutch persecutors. Over time the statue rapidly gained a reputation for miracles in particular for offering protection from snake bites. It is one of the few churches visited by Buddhists and Hindus from across the country. The Madhu Church also holds 10 festivals a year annually with the largest being held on the 15th of August which attracts around 500,000 pilgrims. The church premises were used as a refuge for civilians during the Civil War. This sacred site was also visited by Pope Francis as a part of his travels across the island in 2014. Originally named in Sinhalese as the “Yoda Weva”, which translated in English means ‘Giant’s Tank’, the tank was built in the 5th Century AD with a 7 km embankment spanning 45 square kilometers. Today, Giant’s Tank is a refuge for waterfowl and is used to irrigate a vast area of paddy fields. This is regarded as one of Sri Lanka’s five major Shiva Temples which was established to protect the country from disasters. The Maha Shivaratri festival attracts large numbers of Hindu devotees each year during the moonless night in February. The Vankalai Ramsar wetland and the Giant’s Tank Sanctuary are recognized as key habitats for migrant waterfowl with 0ver 4,800 hectares of protected land. The wetlands and brackish lagoons attract over 80,000 migrant birds per year between the months of November through to March. Spot-billed Duck, Northern Shoveler, Pintail, Garganey, Eurasian Pigeon and Common Teal are among the migrant species of ducks seen here. 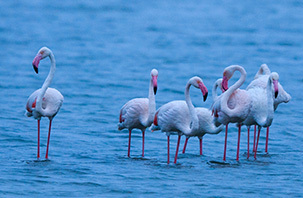 During most years, flocks of migrant Greater Flamingo are seen in Mannar either in the saltpans or in one of the many lagoons. Avocet, Crab Plover, Oystercatcher, Ruff, Painted Snipe and Western Reef Egrets are among the other migrant species seen here. A variety of gulls and terns including the Heuglin’s Gull, Black-headed Gull, Brown-headed Gull, White-winged Black Turn and Caspian Tern can be seen around the fishing harbours. Talaimannar is a recommended site for watching seabirds.